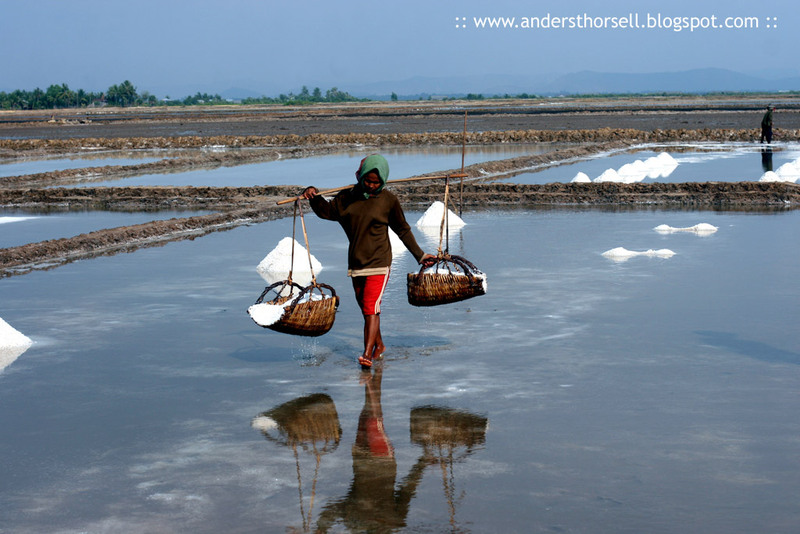 The salt fields of Kampot, Cambodia, are close to the ocean, and water is let in from the ocean to the fields. The fields are then blocked from the ocean, and the water is allowed to evaporate, leaving salt crystals. This process is repeated many times. The raw salt is then collected and piled up in warehouses in the salt fields. Then, it's delivered to the salt factory, where it is cleaned, Iodine is added, and packaged in 50 Kilogram bags, for shipment thoughout the country. Find salt fields on the road from Kampot to Kep, just outside of town, and also, from downtown Kampot cross any bridge, turn left, and keep going for about 15 minutes. You can find motorbike drivers in Kampot willing to drive you for a few dollars. Enjoy your stay in Kampot!